I recently purchased 18 LEGO Disney series 1 minifigure “blind bags.” Why, you may ask? Because I wanted the Alice in Wonderland and Cheshire Cat minifigs! I was hoping to get duplicates of these, so I could have one of each on my desk at work, and then some for home as well. I figured I could trade or sell any that I didn’t want, and I also figured when my daughter is old enough for LEGO some of these would be fun for her to play with. I was not trying to collect the whole series, although that thought crossed my mind when I started to realize how difficult it was to find them, even though they were only released a few weeks ago. As an adult, I was still familiar with 16 out of 18 characters. I guess Disney is forever, right? Now that I have three Toy Story Aliens I’m hoping I can get Buzz Lightyear. I’d like a Peter Pan to go with Captain Hook, and of course I still need the Cheshire Cat. 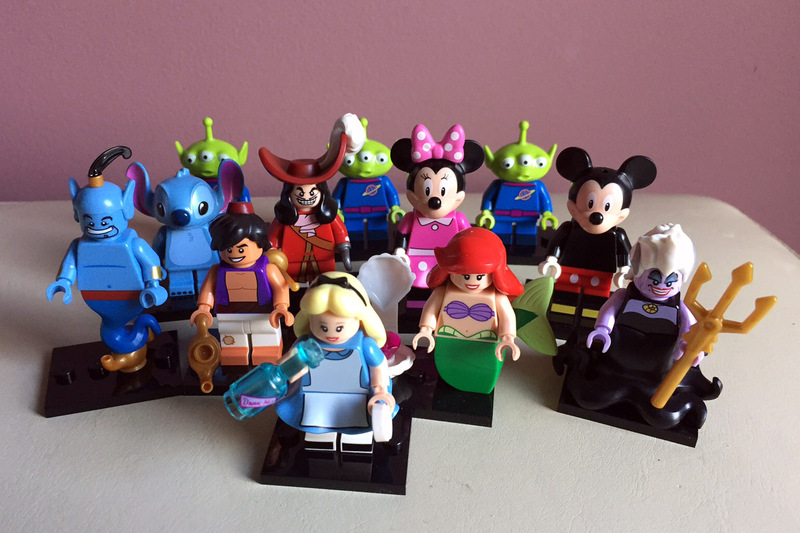 Otherwise I’m pretty happy with what I got, they’re all really cool, especially Ursula and Captain Hook. I’ve sold some of the duplicates and ones that I didn’t want. Software developer. Music lover. Photographer. Technology geek. Enthusiast. Gamer. Dude. Pacifist. Competent human.